There was an interesting piece a while back in La Repubblica, supporting concerns raised by famed (3 Michelin star) Italian chef Niko Romito, as to the bastardisation by the World outside of Italy of their cherished cuisine. Many dishes claimed as Italian are, it would seem, of questionable origin. The addition of cream to a pasta dish and calling it a “carbonara” is a particular bugbear of mine, as to my mind it may be perfectly nice but it just ain’t a carbonara if it has cream in it. Spaghetti carbonara should be made only using spaghetti, pecorino cheese, egg yolk, black pepper and guinicale (or possibly pancetta, but that is stretching it). Less surprising dishes on the list are pepperoni (being an entirely America creation) and (most heinous of all to my mind) Hawaiian pizzas (invented apparently in Ontario, Canada of all places by a Greek chap). 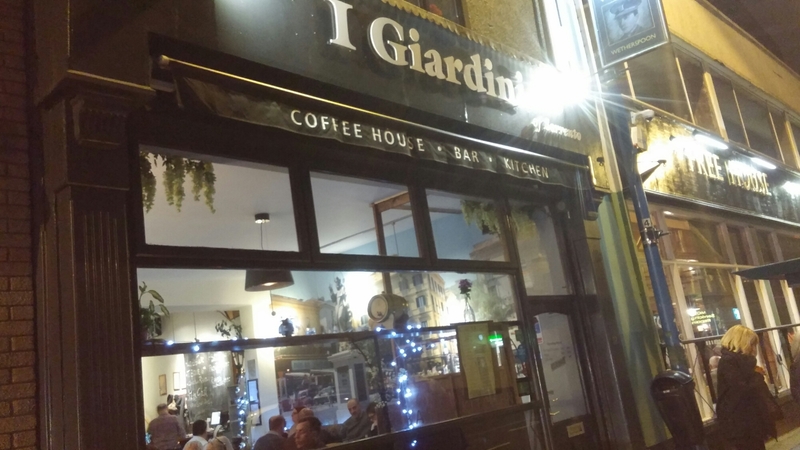 This brings me (in the usual roundabout way) to I Giardini de Sorrento in Cardiff, which seems to have developed a reputation for “authentic Italian cuisine and refers to the food it offers as “being inspired by the Sorrento peninsula” and “Truly Italian”. The latter is a very bold claim bearing in mind the questionable authenticity of many dishes on the menus of a lot of Italian restaurants in the UK. 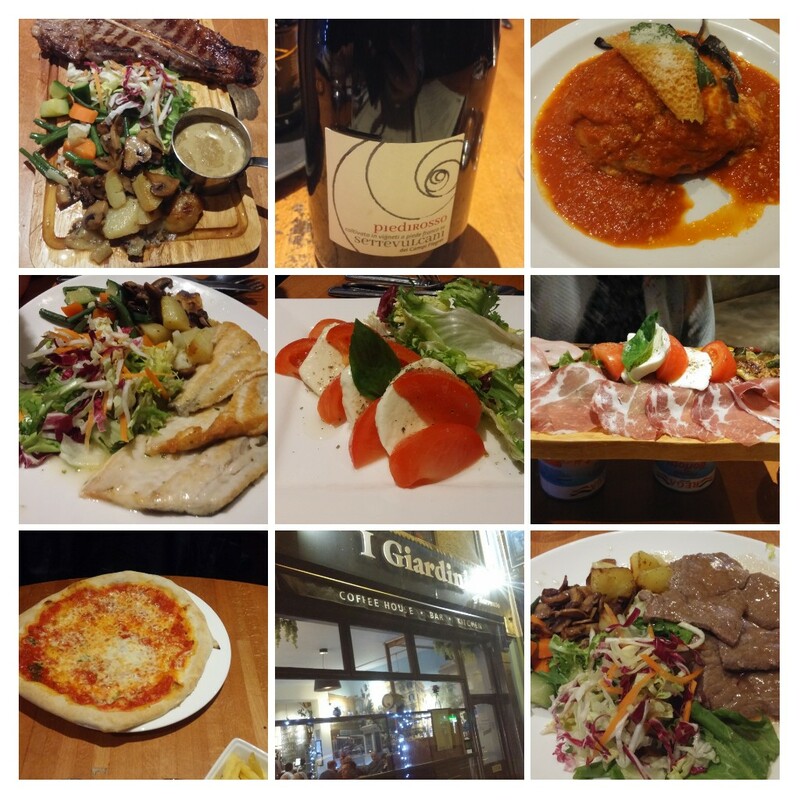 Mrs. SF and I love the Amalfi Coast (which includes the towns of Sorrento, Positano , Amalfi and our favourite Ravello) and the friends who came with us got married in Positano and honeymooned in Sorrento, so we all know roughly what should be expected in terms of food from that area. So does it live up to its authentic Italian billing or is it somewhere which would make Signore Romito’s blood boil? Situated at the Newport Road end of City Road (God how City Road has changed since I lived in a student doss hole on Glenroy Street back in the 1880’s), it was absolutely jam-packed when we arrived at 8pm. Lots of contented looking diners boded well as we were led upstairs. 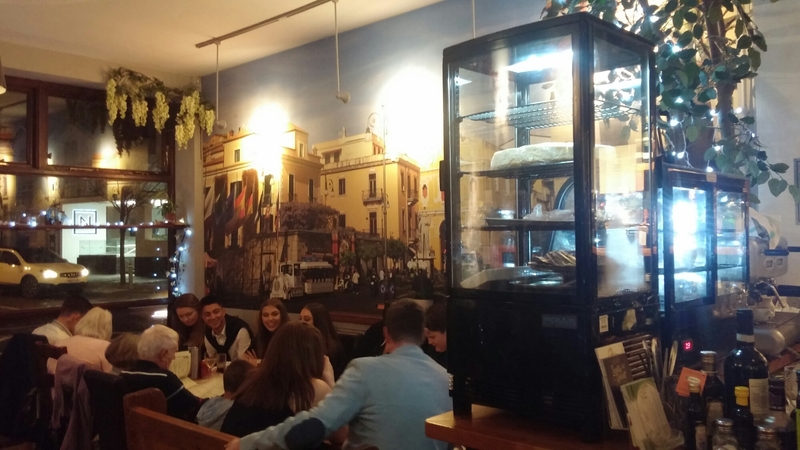 Nice enough inside, downstairs has a more cafe feel to it with a mural of Piazzo Tasso (in the centre of Sorrento) on the walls (which brought back memories of lazy afternoons with a glass of wine in the sun in Sorrento). It had that nice buzz of conversation, which gives atmosphere and means you can’t overhear or be overheard. Nothing fancy upstairs, but down to earth and pleasant enough. 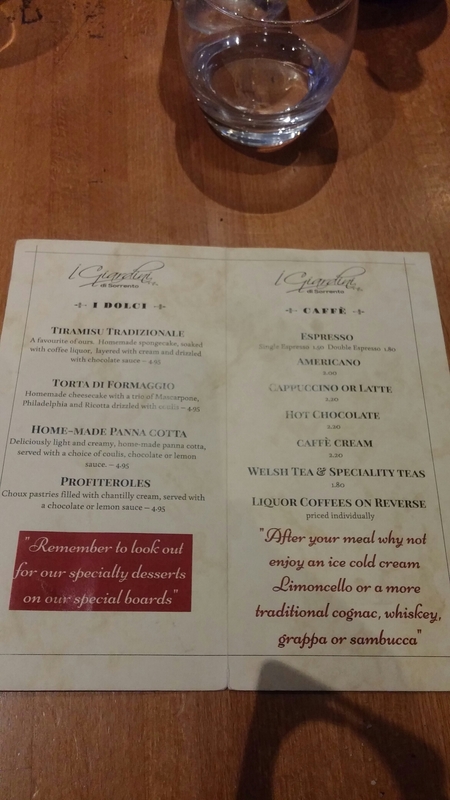 The menu is not ridiculously long and seems (in line with their strapline and name) to focus (although not exclusively) on Campania (the region of Italy in which Sorrento is located). Lots of references to Sorrento’s famous lemons, for instance. In terms of Italian food of dubious authenticity, there is no sign on the menu here of spaghetti bolognese, cream laden spaghetti carbonara or rissoto, garlic bread (with and without mozzarella) or, thank the Lord, gawd awful pineapple and ham pizza (the President of Iceland had it so right when he said it should be banned). Sticking (initially at least) to the Campania theme, we started off proceedings with Parmigiana di Melenzane for me and Insalada Caprese for Mrs SFs. Both Campanian classics and £6.95 and £6.75 respectively. 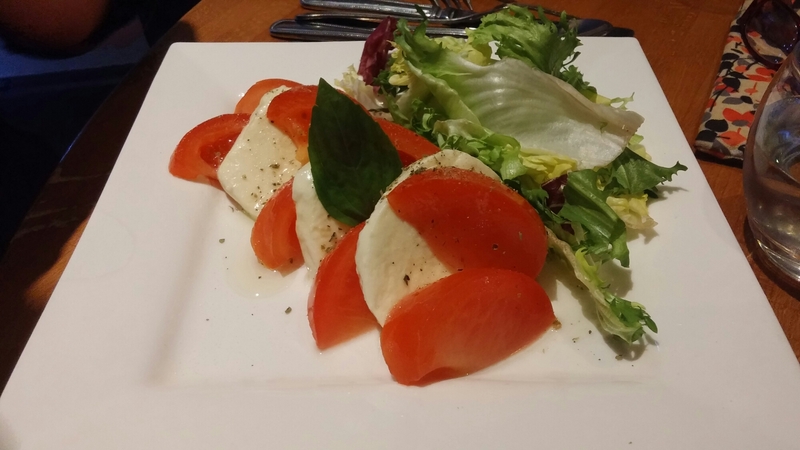 To me Insalata Caprese epitomises what Italian cuisine is all about. The use of a few exemplary ingredients put together simply, so that said ingredients sing. As a result, however, there really is no place to hide with this sort of food. With top quality ingredients Insalata Caprese is an utter delight, but if not it is dull, dull, dull. Tasteless tomato, rubbery mozzarella and cheap olive oil can all operate to take this dish down from the sublime to the truly insipid. Mrs. SF, who ordered this, thought it quite nice. Decent tomatoes (that actually tasted of tomato – all to rare a occurance in the UK these days) and OK – if somewhat lacklustre- mozzarella, with some nice metallic basil and a glug of good olive oil was her verdict. I have a taste and thought the tomatoes could have done with a sprinkle more sea salt and the mozzarella was a bit dull ( for the £6.75 price tag I think it perhaps could have been buffalo which I am pretty sure it wasn’t). Overall nice enough, but let down a bit by the mozzarella (had they run out of the good stuff at that point of the evening I wonder) used. 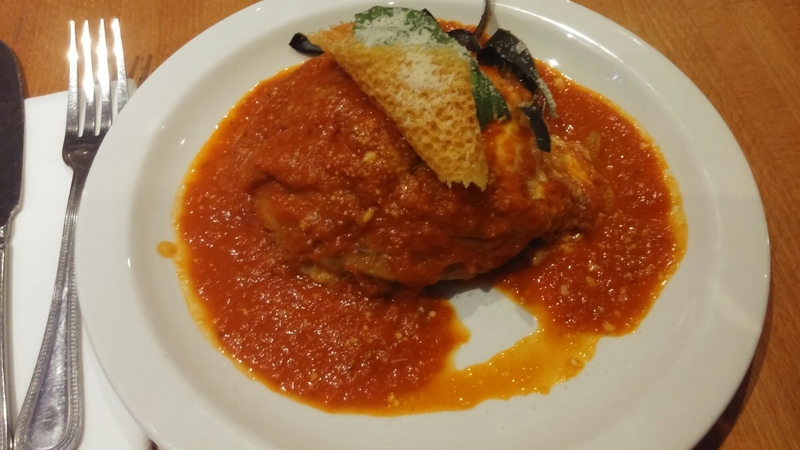 My Parmigiana di Melenzane was a massive portion for a starter and really rather good. Layers of gooey mozzarella sandwich between well cooked slices of aubergine, were topped off with a robustly flavoured tomato sauce. A nice touch was a parmesan crisp with deep fried basil leaves, which had a good texture and flavour. All in all a very satisfying dish. 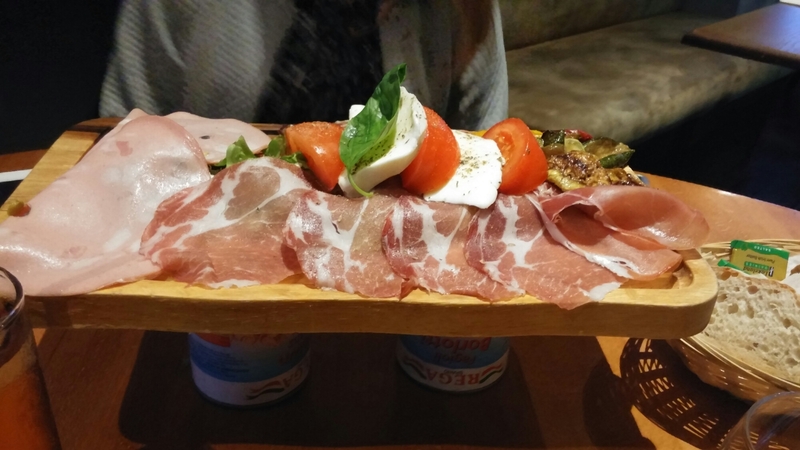 A good selection of cured (coppa and what looked like parma ham) and cooked (mortadella) meats, together with some roasted veg and an Insalada Caprese went down very well. Not quite sure of the Sorrento connection, but all very nice. On to mains, I was torn between the vitello al limoni (with the promise of Sorrento lemons) and one of the specials on the night in the form of a venison ragu. After much indecision, I went for the veal (£15.95 – forgot to ask but am hoping it was British rose veal rather than Dutch veal). Nicely cooked, so tender, this was a decent portion of veal.The acidity of the lemons used worked well with the meat, which itself had a good flavour. Veg. was fairly regulation and I would have preferred the salad separate rather than loaded on the same plate as my veal and veg. as was the case here. It all tasted very nice, although the salad (through the olive oil and balsamic on the table ) needed dressing added to it to pep it up. I enjoyed this dish, but did suffer a bit of food envy when spying the various pasta dishes arriving at tables around us. All looked very good. 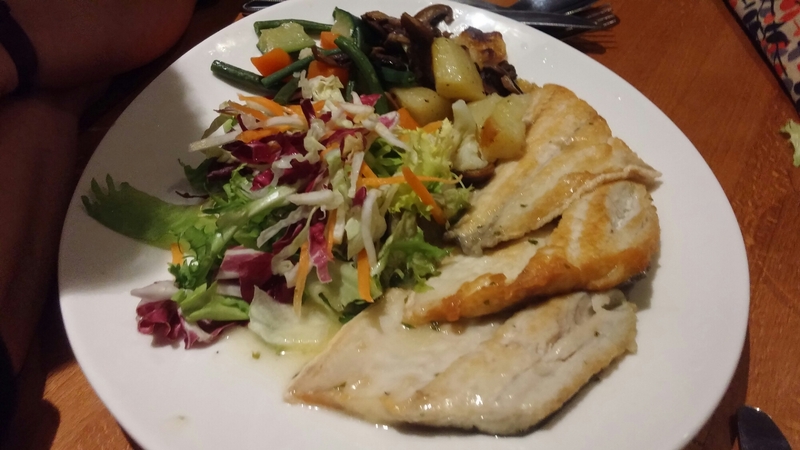 Mrs. SF and one of our friends ordered the “fish of the day” ( £15.95), which was seabass. The three generously sized fillets were nicely cooked (i.e. not over) and had a good flavour to them. This meant the dish got a thumbs up from both of them. Simple methods, cooking wise, executed well with a good base ingredient. Very Italian. 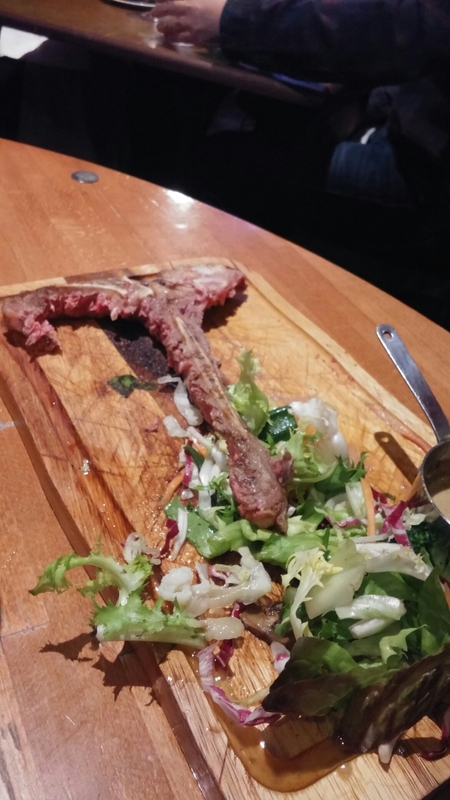 Of the specials, my friend spied and immediately decided on the 16oz t- bone steak (£26.95) on the “Specials” board. 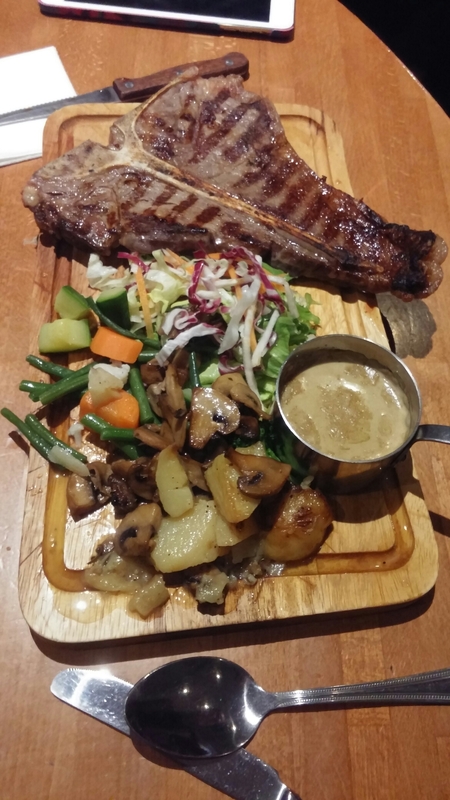 What arrived looked very good (chopping board aside – which the steak over hung – much prefer a plate to be honest). 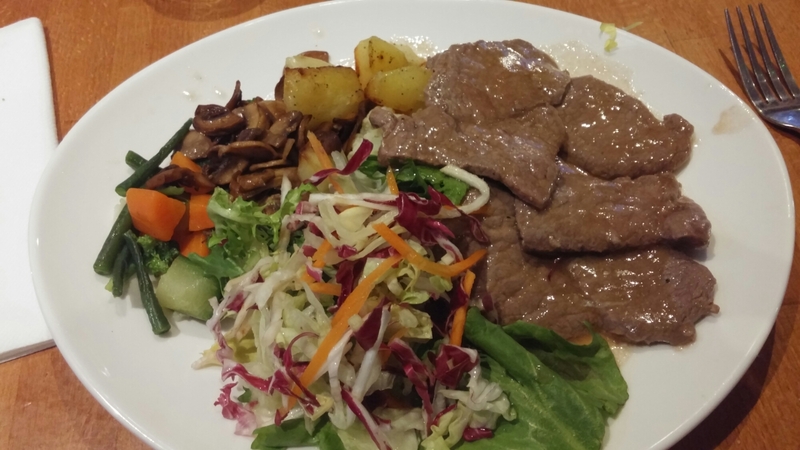 It was a tender, well flavoured piece of meat – cooked “medium rare” as requested. As with the fish, this was a simple dish (easy to bugger up – always amazes me how many places can’t properly cook a steak to a diner’s preference) done well (rather than “well done”). but the likelihood of instant death at the hands of Mrs.SF had I done so meant I refrained (but look at all the meat left on it !!). The final dish ordered was, that Neapolitan classic, a margarita pizza. 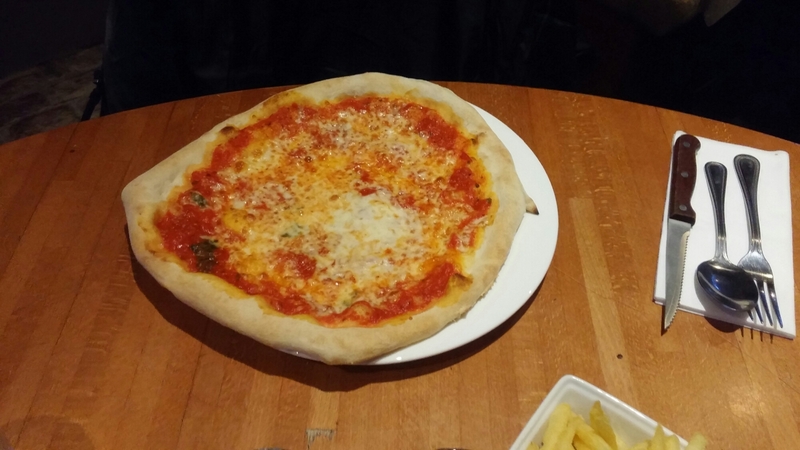 My friends’ daughter is a bit of a stickler when it comes to a pizza (likes a proper one – no fancy pants toppings – having holidayed in Italy many times with her parents) and was very happy with what she got. A good base, with a well made and flavoured margarita sauce and decent melted mozzarella. Only thing missing, for me, was some fresh basil. She did add chips to her order, which elicited a tut from me – the youth of today!! Can never get my head around pizza and chips (more than enough carbs in the pizza so why add chips). The wine list is resolutely Italian. Whilst not exhaustive (would be ridiculously long if it was, as Italy has so many wines to choose from) in terms of what Italy has to offer, it does mix the well know (Chianti, Amarone, Barolo on the reds and Prosecco, Pinot Grigio, Frascati and Gavi on the whites) with the not so well know, including a decent selection of Campania wines (Lacryma Christi del Vesuvio- white and red, Piedirosso dei Campi Flegrei – red, Aglianico Irpinia – red, Falanghina – white and Gragnano Lettre della Penisola Sorrentina – fizz). 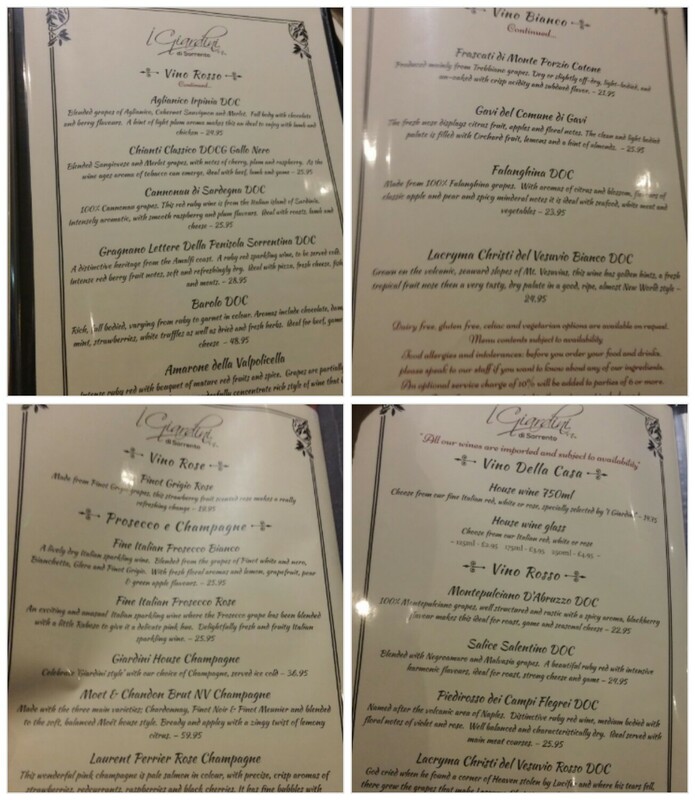 I think it is great they have wines from Campania to go with the Campania dishes on the menu. This is exactly what restaurants in Italy tend to do – showcase the local producers whose wine is made to go with the local food. I always find with Italian food, that a good rule of thumb is to match the local food with the local wine. We, therefore, went for a bottle of the Falanghina (£23.95). 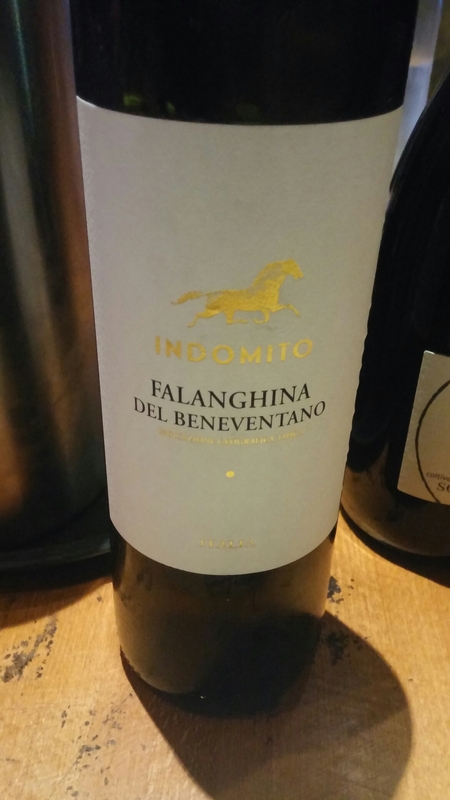 The falanghina had nice citrus and orange blossom notes on the nose and pear and apple on the palate, with just a smidgen of spice. It worked nicely with the starters and the seabass. 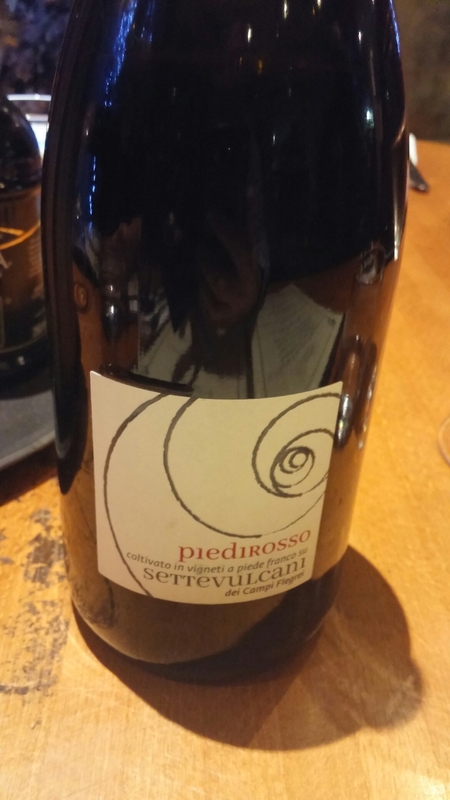 The piedirossa was all cherries (slightly sour) and a touch of dried herbs on the nose and more of the same with a nice freshness on the palate. It paired well with my veal. We all passed on dessert as portion sizes for starters and mains are quite large, but all the usual suspects are on there. 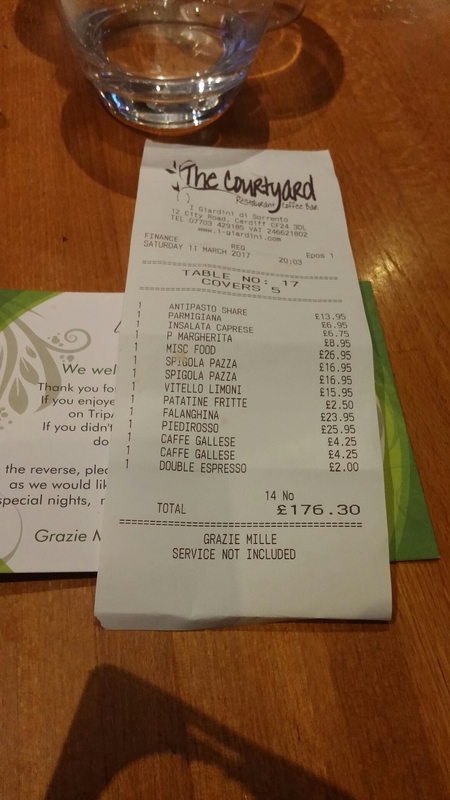 The damage for 6 of us with a fair amount of booze was just over £176 (without a tip – which was given as service was very good). Fair value for what we got I though. As for the question posed in the title of this post, l think this place can legitimately claim to be authentic. 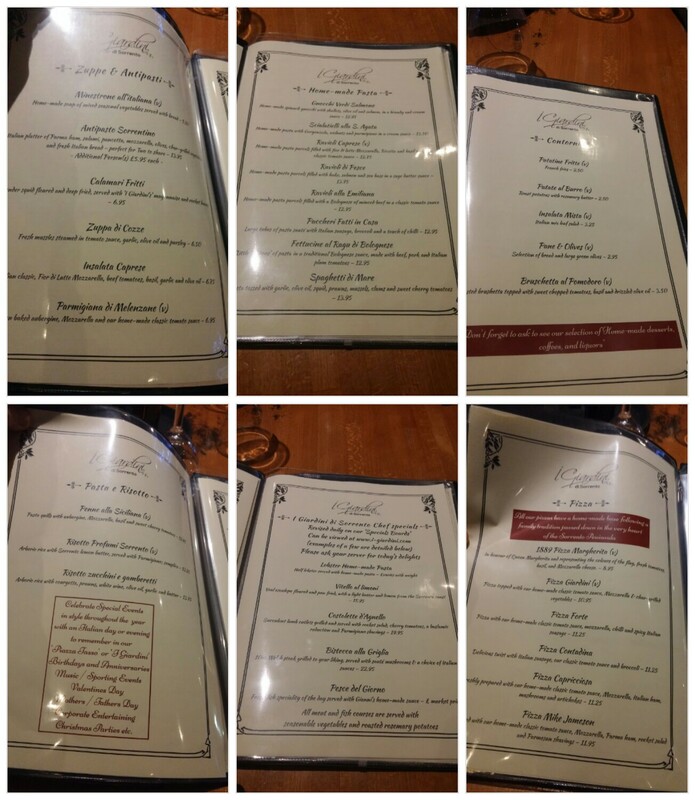 None of the standard “faux” Italian dishes, you see in many of Cardiff’s other “Italian” restaurants (some of whom make claims of Italian authenticity), are on the menu here. It may well not meet Niko Romito’s exacting ‘Michelin star’ standards, but I suspect his Nonna would approve of the place (and in Italy that is all that really matters). Would I go back? Yes, nice place serving good authentic Italian food. 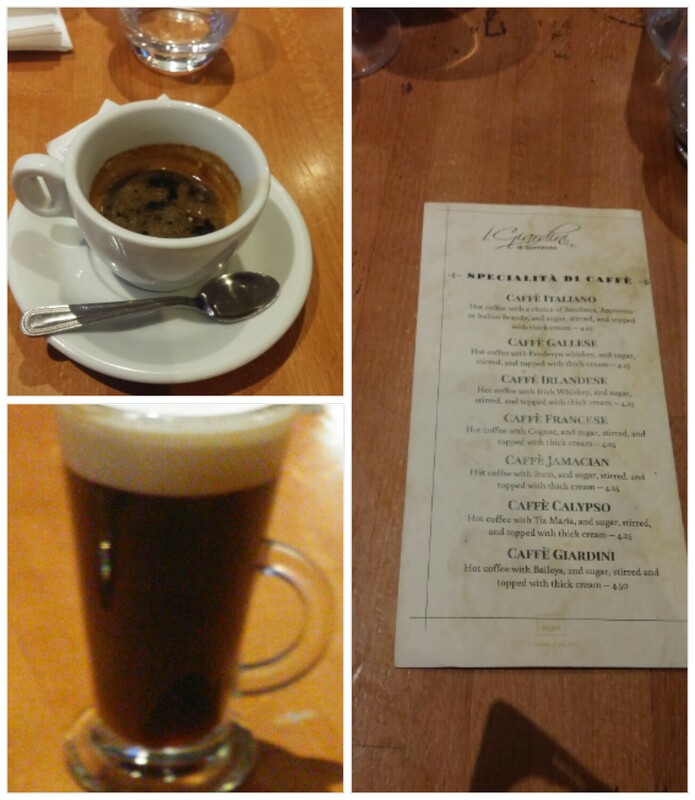 Simple stuff, done well – all very Italian. 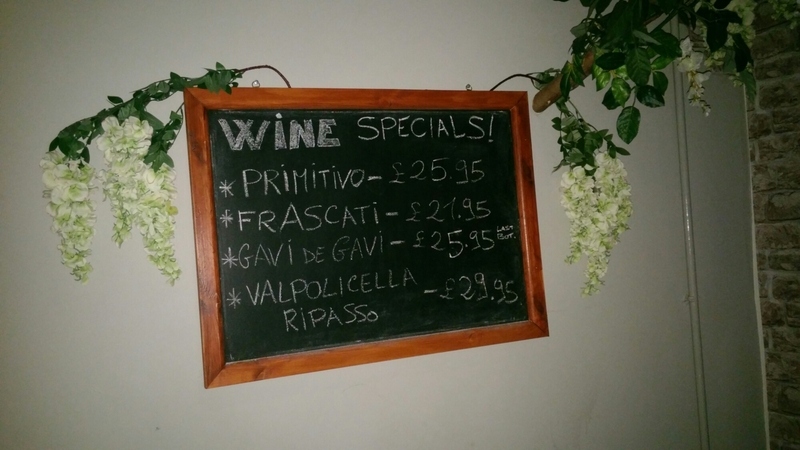 This entry was posted on Mar 19, 2017 by solicitingflavours in Alcoholic drink, Alternatives to sauvignon blanc, bistro, Campania food, Campania wine, Cardiff, Cardiff restaurant, coffee, desserts, Drink, Dry white wine, fish, Food, Food and wine products, I Giardini di Sorrento, italian, Italian wine, Italy, pizza, Red Wine, Restaurant Review, review, Roath, salad, seafood, steak, Uncategorized, veal, White wine, wine, wine mark up, wine pairing, Wok-ker Shaker.